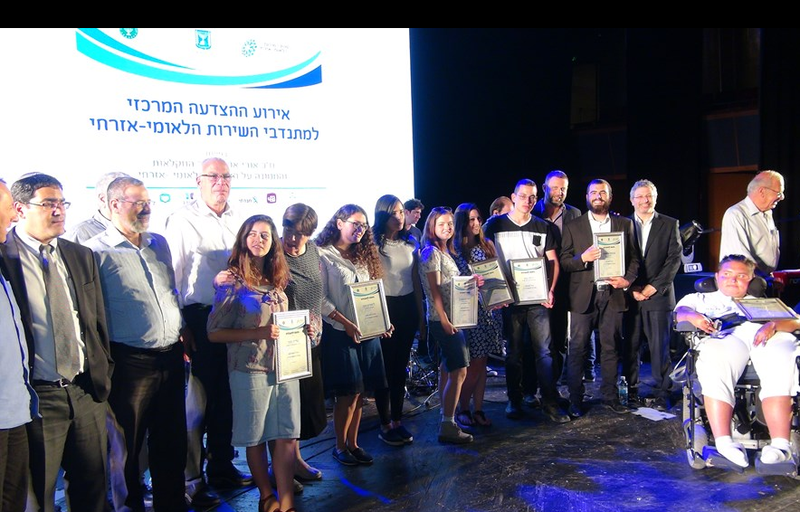 Slava is one of a few select young people who was called to the stage on June 2, during the grand finale of "Salute Our National Service Volunteers Week," to receive a Certificate of Merit from Israel’s Authority for National Service. The ceremony, which took place at Jerusalem's International Convention Center, honored the thousands of National Service Volunteers who offer assistance in schools, hospitals and other public and nonprofit institutions throughout the country for a period of 1-2 years. Slava volunteered as a counselor this year with the nonprofit organization Makom LeKulam (A Place for All), with the goal of raising awareness among school children about issues facing people with disabilities. He and other counselors, representing a wide variety of disabilities, visited schools across the country, sharing their own experiences and leading educational activities. Slava is a resident in ALYN Hospital's Legacy Heritage Fund Independent Living Neighborhood (ILN), which provides a housing solution for young adults, almost all of whom suffer from muscular dystrophy, who require the use of powered wheelchairs and breathing assistance through a respirator. The ILN strives to offer a perfect balance of independent living alongside 24-hour nursing care for the 14 residents, most of whom are between the ages of 20 and 40. With independence and mobility as key values, the residents of the ILN, who each live in their own apartment, share not only indoor and outdoor living spaces, but more importantly share the decision-making about the rules and activities that take place in their "neighborhood." The residents of the ILN stay active through educational, recreational and social activities throughout the day, which are organized and facilitated by the ILN counselors both on the premises of ALYN Hospital and around the city. Slava is the only resident of the ILN to volunteer through National Service, but he’s not the only one who’s caught the attention of the public lately. Another ILN resident, Rafi, was a featured performer in the “Sounds of the Old City” music festival held last March. The 34 year-old has been making dance music for more than 16 years, and can be found creating new beats in his studio apartment in the ILN. During the festival’s “Silent Rave”, he performed alongside DJ Ayal Ben Shimon to the delight of dozens of dancing partygoers. *Photo of Slava fromhttp://www.inn.co.il/News/News.aspx/323333. Photo of Rafi courtesy of Shlomi Ezran.